Graphology is not necessarily a part of my job description. But, as the curator of the Woodberry Poetry Room, I’ve had occasion to grow curious about the convergence of an author’s handwriting with the audio recordings in our collection. Sound archives offer a particularly compelling constellation of human tools and technology. 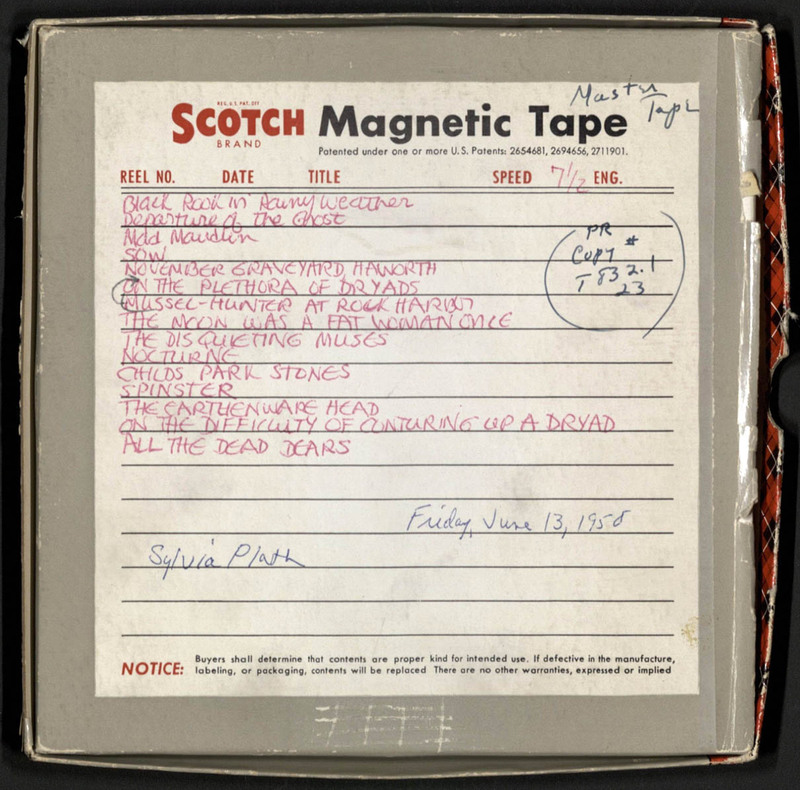 In the case of our Sylvia Plath materials, handwritten track-lists, typewritten manuscripts and sound-tape reels all participate in her poems’ cumulative—and continued—becoming. In Plath’s penmanship, particularly as it appears on the back of her February 1959 reel, there is a curious disjunction between her rotund, balloon-like and almost teenage hand (accompanied by a cartoon animal and a curlicue ornament) and the nature of the poems that she recorded that day—stark, syllabically precise, and highly imagistic texts. The pinkish-red pen that accompanied her 1958 track-list was apparently quite characteristic of her: Plath scholar and former Poetry Room staff member Peter K. Steinberg reminded me that Plath had a predilection for composing her acute and piercing poems on pink paper. But what is the “final” form? An audio archive offers the possibility of the co-existence of multiple instances of a poem and of different embodiments of the poet over time and in variable contexts. Recordings reveal the poet changing his/her relationship to the poems being recorded, as well as alterations in his/her own physicality (the voice aging, the voice growing more confident or tentative, performative or conversational, or in Plath’s case the vowels becoming more British and the consonants more clipped over the course of her very brief recording career). Much like manuscript archives, sound archives also contain variant versions of the seemingly “same” poem—from last-minute title changes to entire stanzas or sections being excised. Sometimes these edits are made in direct response to making an audio recording. Plath herself deleted “The Earthenware Head” from her manuscript shortly after making her 1958 recording (she notes in her diary less than two weeks later, “I am rejecting more and more poems from my book …. ‘The Earthenware Head’ is out: once, in England, ‘my best poem.’”) Along the same lines, T. S. Eliot once spoke of the transformation that occurred in Four Quartets after having to record sections of the poem over and over again due to electrical outages during the Blitz. We often think of a poetry reading (or recording) as a social rite that occurs after a poem is finished—a premiere of sorts. But the fact is, many poets read their poems concomitant with their creation: whether it be reading the poem aloud at their desks as they write or sharing it in public in order to test its inner and outer reception. Poetry readings are not post-creative; they are intensely generative and engaged in the ongoing evolution of a poem or a poetics. 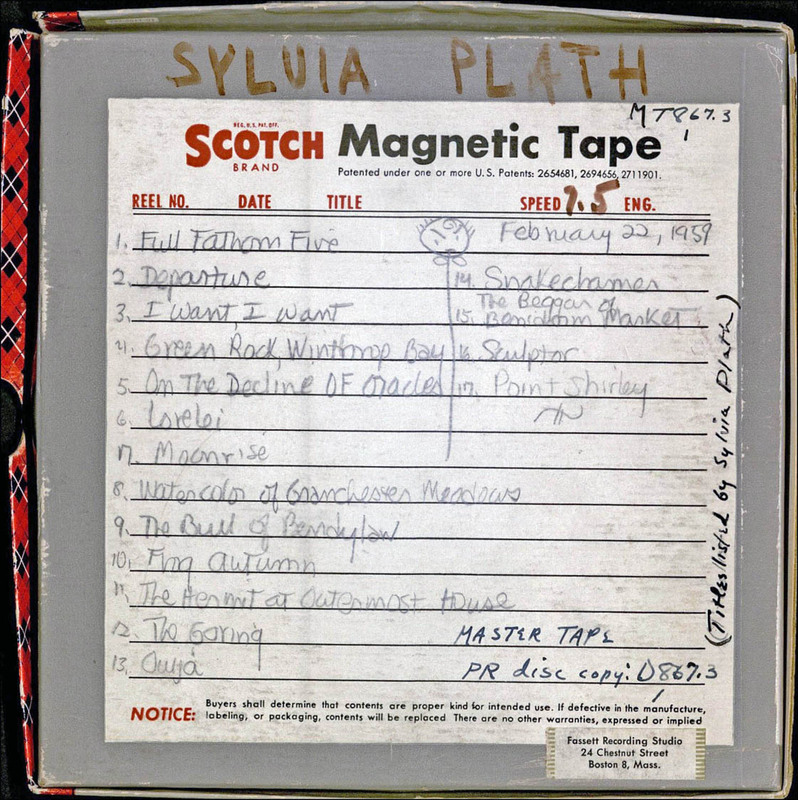 NOTE: The Poetry Room’s Sylvia Plath reels have been digitized and we are currently awaiting word from the respective copyright holders regarding our efforts to make them available online. In the meantime, scholars and members of the public are welcome to visit the Woodberry Poetry Room to listen to these recordings. We also invite you to encounter other recordings via our online Listening Booth.